As advice goes, it’s arguably flawed. Folks who are dead aren’t chatty, but their bodies occasionally pop up at inopportune times. I’ll be talking about unmarked and unremembered graves, insane asylums, and similarly-uncheerful things. It’s not all bad news, though. Someone wrote the Ebers Papyrus, a medical text, around the time Ahmose I was running Egypt. Give or take a few decades. It was probably copied from older texts. Some of the cures probably weren’t effective, except as placebos. We still haven’t improved on its treatment for Dracunculiasis: wrapping the worm around a stick. The Ebers Papyrus discusses ailments we recognize as depression and dementia, which brings me to ancient Greece. We don’t know much about Greek medicine before Hippocrates, apart from what’s in Homer’s Iliad. Dealing with a plague by dedicating a sacrifice to Apollo may show that Greeks thought disease was caused by angry gods.2 That tale is in Iliad, Book I.
Hippocrates of Kos gets credit for starting the idea that diseases come from natural causes, not gods. He thought diseases, including conditions like melancholia, happened when the four humors were out of balance. Folks in ancient Greece and Egypt weren’t the only ones dealing with disease, of course. The earliest record of the Huangdi Neijing is in the Book of Han’s bibliographic section. That was about 21 centuries back now, but scholars figure Huangdi Neijing was written somewhere between Hippocrates’ time and Gaozu’s. Like post-Hippocratic Western medicine, Huangdi Neijing assumes that disease has natural causes. What’s different are the forces and principles they say should be in balance, and how to achieve that balance. Skipping from Hippocrates to the Roman Empire’s collapse, folks in my ancestral homelands weren’t directly affected. We were on the other side of the Imperial borders. But we lost a major trade partner. Grain was a major export. So was amber, although that resource came mostly from places east and north of my homelands. A farmer living between what we call the Cnoc na Teamhrach and Carraig Phádraig might not deal directly with a Roman merchant. But he might trade with someone near the coast who did. Another of my homelands were apparently ‘off the radar’ for Romans. Half my recent ancestors are the dark-haired folks who lived west of the Gotlanders and north of Jutland. Roman tech in Danish graves makes it likely that Danes served in Rome’s army. That wouldn’t have mattered much to my forebears living uphill from what would be the site of Clemenskirken and Mariakirken i Oslo. I’d be surprised, though, if some Roman wealth in Scandinavia’s southern march didn’t cross the water. Trade happens. The first few centuries were rough. But someone, probably in Hallertau, Bavaria, had developed hops by 736. Hildegard of Bingen discussed them, and I’ll get back to her work. Maybe hops aren’t as “civilized” as bronze statues, but what can I say? Beer is a very important part of our culture. Small wine presses had existed for millennia. Monasteries in what’s now France and Germany upgraded Roman designs to deal with the larger quantities of wine they produced. We’d lost the Empire, not the knowledge. I’ve heard that Gutenberg’s printing press was based on wine press designs, but that’ll wait for another post. I’d like to say that we developed the first horse collar, but that was an import. Folks had been making horses pull loads by a strap wrapped around their necks at least since Babylon absorbed Chaldea. The horse’s neck, that is. Neck straps work, but not very well. Someone in east Asia improved on that design during China’s Warring States period. Europeans might have started using the new tech sooner, but most east-west trade and communications ended along with Roman authority. We had our hands full, dealing with local and regional issues. Chinese tech caught on in Scandinavia around 920 AD. Vikings and their knerrir were traders centuries before the Hanseatic League, and that’s another topic. Saint Hildegard of Bingen wrote “Physica” and “Causae et Curae,” combining practical knowledge from her work with Disibodenberg’s garden and infirmary with theoretical knowledge gained by studying the monastery’s library. Folks used Disibodenberg as a quarry after the Reformation hit, re-excavating the ruins in the 1980s. We kept St. Hildegard’s research, though, and kept learning. Monasteries like Disibodenberg served as education and medical centers in the centuries between Imperial Rome and Bedlam. They still do. I’d prefer not needing institutional care. But given a choice, I’d rather be sent to the Brothers of Mercy than a place like Bedlam in Hogarth’s day. Bethlem(!) Royal Hospital didn’t start as insane asylum. That came after 1300, with good intentions. 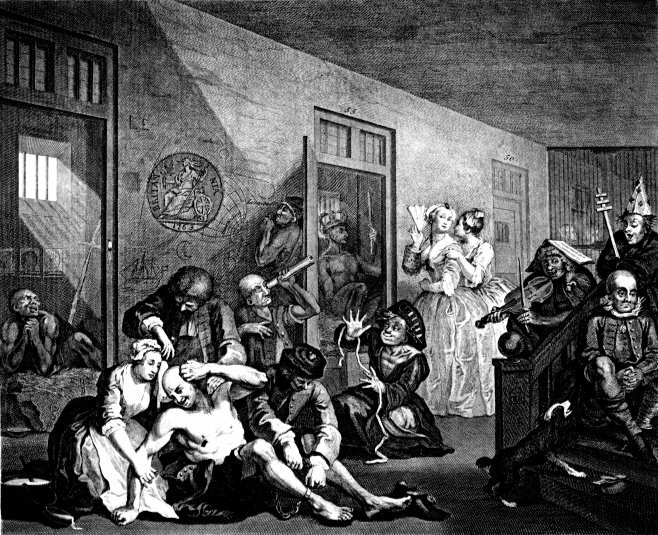 Lunatic asylums started being called psychiatric hospitals after Hogarth’s day, again with good intentions. Folks don’t visit lunatic asylums for entertainment these days. I don’t know if reality television is an improvement, and that’s yet another topic. I also don’t know if abuses of comparatively helpless folks are more or less likely when outsiders might pop in for a look. “The remains of at least 7,000 people may be buried beneath the University of Mississippi, officials estimate. “The bodies of the state’s first mental institution – called the Insane Asylum – stretch across 20 acres of campus where administrators want to build. “Officials predict that it may cost up to $21m (£16m) to exhume and rebury each body – more than $3,000 for each. The good news is that at least some of seven-thousand-plus bodies are buried at the U. of Mississippi Medical Center (UMMC) were in coffins. That wasn’t clear in the first several headlines I saw. I didn’t know what to expect. The number of corpses argued against this being the work of a mass murderer. “Forensic anthropologists are disinterring the remains of children at a Florida reform school. Former students hope the dig will provide answers about alleged child abuse within the school’s walls. “Within the past year, anthropologists working for the University of South Florida (USF) have exhumed the remains of 55 children on the grounds of the now-shuttered Arthur G Dozier School for Boys. The oldest part of this institution was renamed “Arthur G. Dozier School for Boys” in 1967, to honor a former superintendent. That is not the sort of honor I’d want. Florida’s authorities sent boys to this processing center from January 1, 1900, to June 30, 2011. On paper, it was supposed to “reform” them. In practice, some were raped, some killed, some abused in other ways. Allegedly. Some survived. It’s possible that survivors who talked are lying, but bodies being found say otherwise. USF’s forensic anthropologist Erin Kimmerle said her team’s investigation found that some boys died when a fire reached the rooms they’d been locked up in. Some parents got their sons’ bodies back, others didn’t. They were told that their children had been buried, but Dozier staff wouldn’t tell them where. Eventually the parents died, too, leaving relatives with unfinished business. Now that the “school” is closed, folks other than school staff are looking over the grounds. The property is being sold, which gives USF’s forensic anthropologist Erin Kimmerle until August to find and recover bodies. That wouldn’t have been possible until recently. Ground-penetrating radar dates back to the early 20th century, but wasn’t practical until the 1970s. The first affordable civilian equipment came in 1985. Maybe kids killed while the place was in operation will all be found and identified. It’s a step in the right direction. Looking back, it’s easy enough to see what went wrong. Staff at the “school” weren’t trained adequately. They didn’t get around to telling folks at the state level about assorted beatings, rapes, deaths, and leg irons. Maybe state bureaucrats felt that ‘no news is good news.’ Maybe they didn’t see a point in telling Dozier staff how to deal with “incorrigible” boys. I could blame families of kids who disappeared there for not hiring the best lawyers in Florida, but many were at the low end of the economic scale. Applying one set of biases, the boys at Dozier and their families are victims. Another set makes them guilty of being ‘of low type.’ I figure they couldn’t afford lawyers, and may not have realized that questioning authorities was an option. I remember the ‘good old days’ before 1964, when some Americans were still getting over the shock of women voting. Unqualified respect for authority wasn’t nearly as universal, or well-deserved, as some apparently believe. And that’s yet again another topic. “John Olson was 10 years old when he stood on the grounds of Brookdale Cemetery and watched his father dig a grave for an infant. At least 14 folks are buried here. Most are babies who died at an old “reform school” on Sauk Centre’s north side. The State Industrial School for Girls (SISG) opened in 1911. The idea was giving “care, training, and education of girls who had been declared delinquent and committed by the courts.” I don’t know how effectively that good intention was carried out. I’m pretty sure that having a separate facility for girls was an improvement over housing all kids convicted of a crime at the Red Wing Training School for Boys & Girls. Severely retarded kids lived at the Sauk Centre Home for Children, a subdivision of the SISG, starting in 1951. SISG had been renamed Home School for Girls by then. Starting in 1959, Minnesota had a Corrections Department. The Sauk Centre Home School was in its Youth Conservation Division. In 1967, we were back to putting adolescent boys and girls in the same facility. The place got yet another new name in 1979: Minnesota Home School. From then until it closed in 1999, the place was coed. I doubt that many folks living on Sauk Centre’s north side, particularly those within easy walking distance of the Home School, miss the place. I haven’t looked up the statistics, but every few weeks I’d hear of another “runner” who stole a car. Local speculation was that the kids knew a good thing when they saw it. They had free room and board, and recreational facilities that occasionally included a stable. Aside from a comparative lack of privacy and freedom, their standard of living was on a par or better than many Sauk Centre residents. Leaving without permission and stealing a car made an extended stay a near-certainty. I don’t think conditions at the Home School should have been worse, or that the kids were being pampered. I do think that the system was as imperfect as any other we’ve used, for dealing with youngsters who misbehave. Like I said, most of the folks buried at Brookdale Cemetery are babies. Some may be young mothers from the old reform school. Childbirth is far from easy, and some young women were likely enough not in the best health when they arrived in Sauk Centre. Records of who was buried were lost, somehow. Grave markers would have helped identify the bodies, but there aren’t any. Someone, presumably a state employee, took the markers. I don’t know why. Maybe the markers were made of metal, and recyclable. Ideally, folks like the Ritters would have realized that the government wasn’t reliable, and kept their own records. That didn’t happen, so now some members of the local Knights of Columbus built a fence, have started mowing the grass, and are trying to reconstruct burial records. Some records did survive. Many are not available to the general public. Privacy rules say that some personal data must be sealed for 75 years from the date of the last entry. I don’t know why so many folks act as if they think gloominess is next to godliness. Fashionable melancholy isn’t limited to spiritual wannabes. Pessimism above and beyond the call of reason has been a required attitude for centuries, off and on, for folks with pretensions of high culture. The ‘gloominess is next to Godliness’ attitude may account for my culture’s perennial End Times Bible Prophecies and their secular equivalents. I don’t know why so many folks use fear as a motivator. Maybe scaring folks into supporting an idea is easier than showing that it makes sense. Maybe folks just enjoy feeling insecure. The headlines are right. That’s a reasonable summary of what Hawing has been saying. What’s new is how much time he says we have left. I think he may be sincere. He’s also got a new documentary coming on BBC: “Stephen Hawking: Expedition New Earth.” His proclamations of doom are likely to boost the show’s ratings. I think he has a point: to an extent. Epidemics and famines still happen. Thanks to post-Gutenberg information tech, we can be much more aware of them. We can also deal with them. Starting in the mid-17th century, rapidly-changing technology and economic systems streamlined growing and distributing food. Food still isn’t getting to all the folks who need it. But I think it’s a distribution issue. The new technology isn’t idiot-proof safe. No technology is safe. Even fire is dangerous if we don’t use our brains. Living in a dangerous world is nothing new. What’s changing is how much we know about assorted threats, and what we can do. We’ve been learning that asteroids and comets hit Earth at irregular intervals. We don’t want a repeat of the last big one. The point is that we’re learning. We’ve even seen the last of smallpox, most likely. We’re still discussing whether to keep the few remaining laboratory samples. I think we should. It looks like smallpox started in African rodents more than a dozen millennia back. Infected critters could still be around, and viruses have a habit of moving from one species to another. We do not want to go through something like the 1870-1875 pandemic again. Getting back to Hawking’s warning and documentary, I don’t think that we must begin living on other planets in the next century. One of these days I may take a longer look at folks like Nietzsche and Santayana. Today I’ll repeat two of their one-liners, with a brief — for me — look at why I think they have a point. I was one of ‘those crazy kids,’ a half-century back, who thought that much of what passed for “morality” in America made little or no sense. That’s why I think Santayana’s ‘remember the past’ quote makes so much sense. Our actions will lead to a better world: or not. Generations who will live in the centuries, millennia, and more, ahead depend on our decisions. That’s nothing new. What’s changing is how much knowledge we have accumulated: and how much wisdom we use. If we remember that people matter, all people, I think the future looks — not perfect, but good. Better than today, for the most part. “‘Here, then, I have today set before you life and prosperity, death and doom…. This entry was posted in science news and tagged America, bioethics, civilization of love, future generations, health, history, hope, medicine, mental health, science. Bookmark the permalink.